Sloan's "Learn 2 Ride" Rider Training Experience! Sloan's sponsors several levels of motorcycle rider training and education programs in cooperation with Mid-Tenn Motorcycle Education Center and the Motorcycle Safety Foundation! Our course has been the state of Tennessee's largest Learn2Ride program since 1998, and has received the State of Tennessee STAR Award for the highest achievement in safety, quality, Rider Coach development, and program promotion. The state of TN will waive the riding and written portion of your Motorcycle Endorsement Test if you successfully complete our Learn2Ride course! 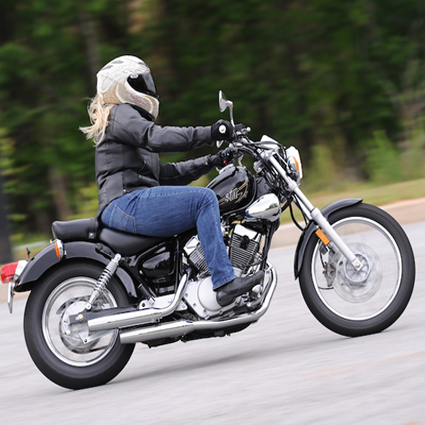 To register for a Learn2Ride class Click Here, or call Dee at 931-823-7744. Or check out our website: ulearn2ride.com Classes are offered each weekend through mid-December! Times - Saturdays: 8 am - 5 pm, Sundays: 8 am - 5pm. Location - various locations throughout middle Tennessee. Cost - $210 This 2-day course is for beginning riders of ages 15 and up. The best place for a new rider to start once they've made the decision to ride or if they are returning to riding. Successful completion of this course serves as a license test waiver program in Tennessee. Mid-Tenn provides motorcycles and helmets which are provided for your use during the course. Also, a course completion card earns you a liability insurance discount of 10%! Times - Saturdays & Sundays 8am - 1pm. For riders who already have basic skills. It is similar to the BRC except the speeds are higher and riders should be riding their own motorcycle (options for using our bike are available please ask). It is an excellent refresher course for practicing and renewing basic riding skills and also serves as a license waiver if complete the optional skills evan and written test. Women Only (Learn to Ride) - $299 - Learn with other women who have not had much if any motorcycle experience. Classes are held to 6 or less and provide a great deal of individual attention. Scooter School - $210 - Take the course on your own scooter to gain valuable experience on your own ride. Private Classes (one-on-one) - $500 - Need a class during the week or just want one-on-one instruction Most driving range work is done in one day when classwork is done at home before class. Trike Class (private 2 day course) - $499 Experienced Trike Rider One Day Course - $299.